Since 1981, HMMH has provided world class consulting services in the areas of noise, vibration, airport and airspace planning, air quality, and sustainability and energy. We are seeking motivated individuals who strive for excellence, are passionate about rising to the top of their field, and interested in advancing the tools and practices used by hundreds of firms worldwide. We pride ourselves on providing opportunities for advancement while maintaining a healthy work/life balance, with nearly one-third of our full-time team members working remotely. HMMH is an Equal Opportunity Employer M/F/D/V. Before you apply, we encourage you to learn about the people you would be working with, projects that you can expect to encounter once you’re on our team, and why HMMH is the perfect place to advance or even start your career. HMMH is proud to be part of the Boston Women’s Workforce Council, striving to achieve equality for women in the workplace. In 2016, we were one of the first national signatories to the White House Equal Pay Pledge. 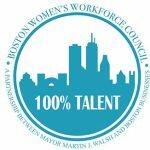 Locally, we are a signatory to the 100% Talent Compact, an initiative of the Boston Women’s Workforce Council, which served as a model for the national pledge.